Kakteen Sukk. 26(2): 25 (1975). R631(Collector: Walter Rausch Locality: Camargo - Culpina, Chuquisaca, Bolivia) This simple plants create amazingly rich shapes with intensely coloured, orange flowers produced in abundance from the lower stem. Altitude: about 300-3700 metres above sea level. Habitat: They grow on steeply sloping ground where water rarely stands for any length of time. 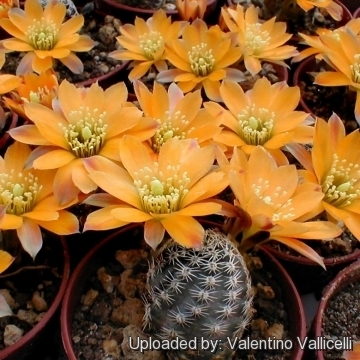 Description: Rebutia diersiana is one of the many geographical forms of the extremely variable Rebutia pygmaea. 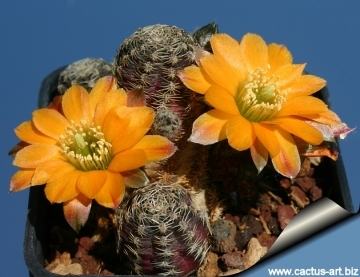 It has a distinctive yellow or orangish-yellow flowers. 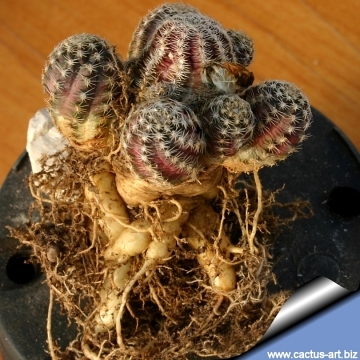 Habit: It is a small geophyte cactus, with a heavy tap root that may exceed the size of the plant above soil level. Solitary or often clustering in cultivation. Stem: 1 to 2 cm wide, spherical to slightly oblong, becoming short-cylindrical in cultivation. Epidermis light green , often with a purple-brown tinge. Ribs: About 10 slightly tuberculate. Tubercles: About 2,5 mm high. Areoles: Oval, slightly whitish tomentose, 2 mm long, with abundant white or light brown felt, a little far apart. Radial spines: 1-12, thin, bristly, pectinate, glassy white, 1-2 mm long. Flowers: From the basal parts of the stem, widely funnel-shaped about 30 mm long and wide. Ovary greenish with a few dark green scales with white wool and bristles. Floral tube, pink with few, narrow, dark green scales with white wool and bristles. Outer perianth segments lanceolate, pinkish-yellow with darker purple tip and with purple central ribs. Inner perianth segments lanceolate, pale yellow to golden yellow. Throat white. Filaments white. Pistil greenish-white, stigma with 5-6 greenish segments. Fruit: Spherical, greenish, about 6 mm large. 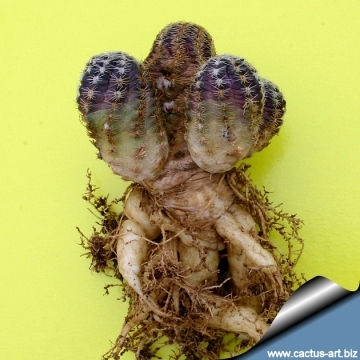 Seeds: Oblong spherical, about 1-1,2 mm long and 0,8-1 mm wide, brown-black, testa quite distinct, oblong, slightly convex. 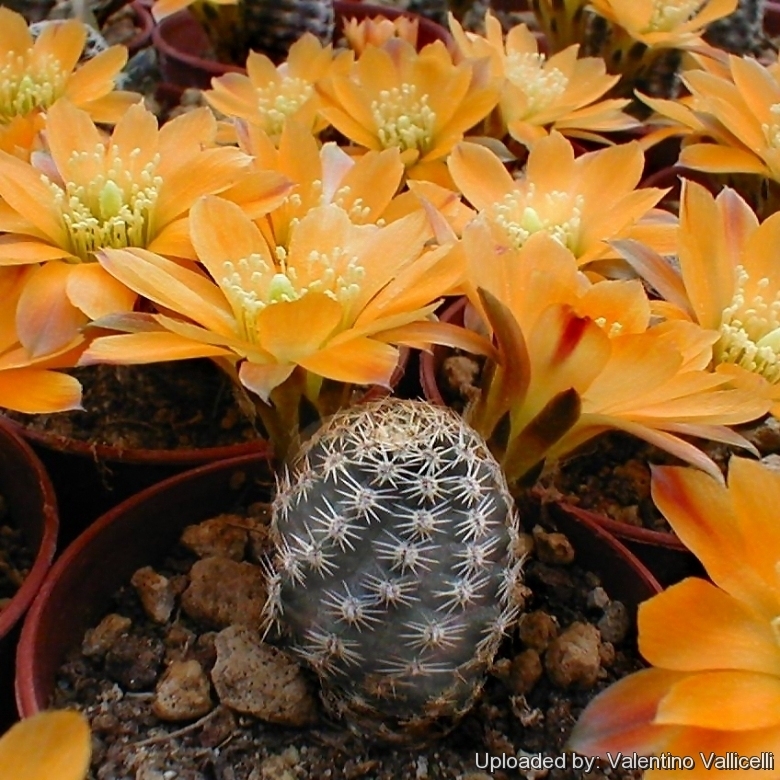 Cultivation and Propagation: Rebutia diersiana is a summer grower species that is easy to cultivate and recommended for beginners. The whole Rebutia pygmaea complex has delightful flowers and the plants remain compact, and clumps can easily be managed by division. Another advantage is that the plants are very cold hardy in Winter if kept dry.